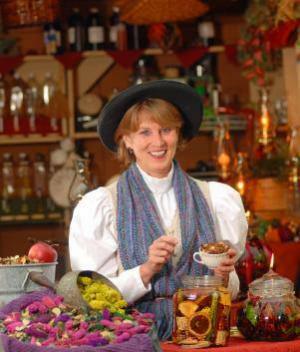 Autumn in Branson brings the National Harvest & Cowboy Festival to the scenic grounds of Silver Dollar City, September 16 – October 31. This annual fall festival transports visitors to a time before machines and assembly lines, when craftsmen put their hearts and souls in to the goods they made. You’ll find this same breed of men and women from across the nation gathering at Silver Dollar City in Branson to display their talents in crafts as diverse as basket weaving, fiddle making, soap making, and many other time honored traditions passed down through generations. 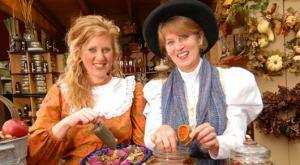 Its just one more of a long list of awesome annual Branson events. Autumn in the Ozark Mountains around Branson is a sight to behold. Many vacationers choose this time of year for their visit due to the beauty of the changing leaves, and the mild weather. These things both contribute to the atmosphere of the National Harvest & Cowboy Festival at Silver Dollar City. There’s nothing like a scenic stroll through the park as live, bluegrass music, is playing and the smells of frontier cooking fill the crisp, fall, air. You’ll also find street dancers and other performers, as well as the craftsmen, all in period-correct clothing, displaying their talents within the charming setting of a real, 1880’s village known as Silver Dollar City. 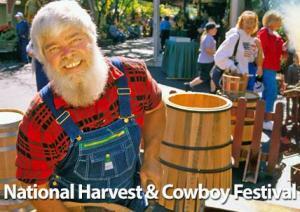 This is the National Harvest & Cowboy festival after all! Buck Taylor, star of television’s Gunsmoke, brings his Cowboy Emporium to Silver Dollar City. Buck’s Cowboy Emporium showcases old west arts such as saddle making, as well as Taylor’s own water color paintings. You’ll also find a real, old west style, barn dance, breaking out every evening throughout the September 16 – October 31 run of the National Harvest & Cowboy Festival. More events are sure to be announced throughout the year leading up to the National Harvest & Cowboy Festival. BTPA has been assisting travelers for over a decade by providing savings of both time and money on their Branson vacations. If you would like more information about SDC’s Nat’l Harvest & Cowboy Festival, contact one of our experienceed Travel Agents for more information.